Get ready for Halloween! Learn about owls, the animals often associated with the spooky holiday. 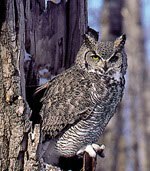 North America’s owls are commonly thought of as secretive and nocturnal forest inhabitants. In fact, many owls can be observed, or at least detected, during daylight hours. With a little experience, they can be discovered relatively easily. Long Pasture Director Ian Ives teaches our audience how to identify Cape Cod owl species and describes their life histories. Discover the art of owling and have a spooky good time!